Vamo V7 Sub Ohms 40 watt has just been released! The variable wattage digital mod maintains the famous Vamo V5 design with improvements that utilize key significance allowing to extend the unit in continuing to be a favorite. Moreover, it capable of firing Sub Ohms coils if appropriate battery with correct Amps is used. 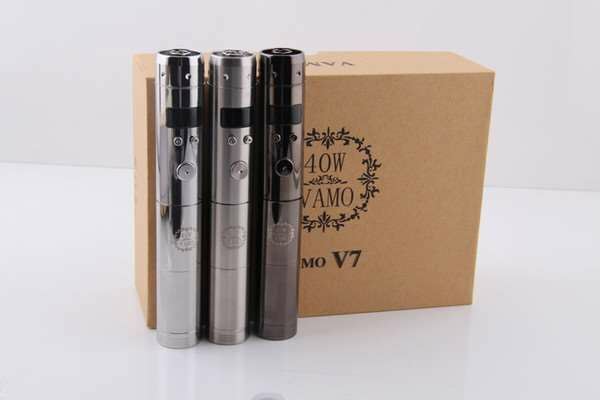 What is the Vamo V7 compared V5? The first issue that has been improved is the connection pin. In previous generations, the 510 connection pin had some issues and went through changes until finally deciding on using a silver plated contact pin screw that can be adjusted using a flat head screwdriver. This will allow a wide range of atomizers to be used that may have various lengths. The second update is the battery spring located on the bottom cap, which is now silver plated as well for better conducitivity. The Vamo V7 still maintains the extended tube for using a single 18650, 2 x 18350 or one 18350. New Vamo V7 With the improvement of the chip, it is now strongly recommended to use higher amps batteries which will list the general specifications necessary depending on your resistance. The chip has some great novelty features which the first thing you will notice is the wattage being able to go up to 20 watts. The OLED display screen can provide volts, watts, puff count, atomizer resistance, output current and vaping time. Finally, another great feature is the ability to attach a USB adaptor that will allow you to charge USB related devices (adaptor sold separately). Note: If planning to sub ohm with a 18350 battery, it is strongly recommended to use a 10.5A or higher.